To purchase a digital download of the CDs, click here. Finally you can have fun learning to read music! Have you always wanted to play the piano? Playing duets is one of a musician's great joys, but finding stimulating repertoire for two beginning pianists is not so easy—until now. 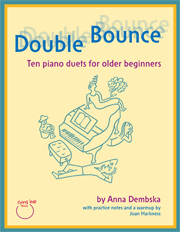 Anna Dembska's ten duets from Piano, Body and Soul offer beautiful, sophisticated sounds to adventurous pairs of players. 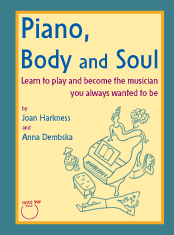 This book/CD set is perfect for teachers seeking duets for teens and adult beginners, lapsed pianists looking for a fun and inspiring way to get back to the keyboard, and Piano, Body and Soul students who need a second score for their piano partners.